When running a commercial kitchen the TR19 cleaning standard is what your kitchen is held to. This is so that you avoid hazards, including dangers to the general public and your employees. A company was set up dedicated to upholding kitchen standards and protecting the general public, they decided to make this easier by providing a book with guidelines to be followed to regulate these standards, this book is known as the TR19 and the company is called B&ES. Since the introduction of the TR19, it has now been made into a law that you are required to present a document showing that your kitchen has been cleaned to this standard, this is to be presented to your insurance companies so that in the event of a fire, you will not be held accountable, and instead the company in which cleaned your kitchen will be liable. 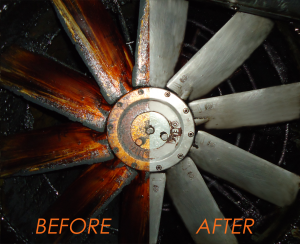 OvenKing offer a TR19 cleaning standard for commercial extraction systems; canopy/hood, ducting, fan and fan housing all cleaned to TR19 standards. We produce comprehensive reports for the cleaning undertaken and provide a certificate after the clean when finished to TR19 standard. OvenKing also offer a TR19 inspection only, the inspection is a comprehensive check of the current state of a kitchen extraction system. 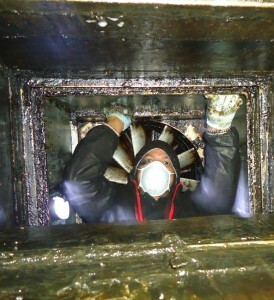 As part of the inspection we inspect all of the items that would be cleaned as part of the TR19 clean. 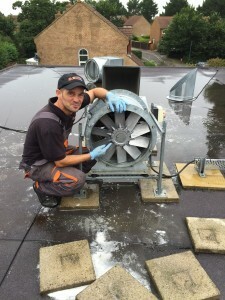 We inspect the canopy/hood, ducting, fan and fan housing. At the end of this inspection we produce a TR19 certificate reporting on what has been found and whether the inspection has shown a pass or a fail. OvenKing offer this TR19 inspection only service at a cost of £150 + VAT. Consider it as an MOT for your kitchen extraction system. Contact us using the form below to book in your TR19 inspection. Use the form below to contact us regarding a full TR19 inspection or to book in a TR19 clean. Enter a few details below and one of our commercial team will be in contact shortly.